Kärnerimaja cafe is open May until September. In June, July and August we are open Wednesday, Thursday and Sunday 11.00-18.00 and Friday and Saturday 11.00-20.00. In September we are open Thursday, Friday, Saturday and Sunday 12.00-18.00. From October until April we are open advanced order. 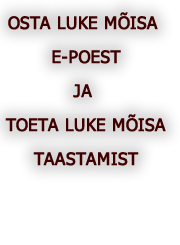 We are very careful if all groups, bigger then 10 people, call 55 68 90 96 or send a e-mail info@lukemois.ee before their visit. It is necessary that all people can feel good when they visit us. Event program 2016 coming soon!